Imagination Library (605-624-5354): Provides free quality books, delivered monthly to children from ages 0-5. Vucurevich Children’s Center (605-677-6880): Supports University of South Dakota’s student-parents by providing quality, safe, stimulating childcare in a child-centered environment. This allows student-parents to focus on their education to better provide for their families. American Red Cross serving Eastern South Dakota (605-336-2448): Provides disaster relief, services for military families, and health services for people in the Vermillion area. Domestic Violence Safe Option Services (605-624-5311): Provides confidential, free of charge services for victims and survivors of domestic violence, dating violence, sexual assault and stalking. They also provides support services and public education programs to eradicate domestic violence. Clay County Child Protection Team: Provides parenting classes and Red Cross Babysitting classes to the community, as well as raising awareness of child abuse and neglect. Salvation Army (605-624-3120): Provides emergency funds for people in crisis (i.e. facing eviction, utility shut off, temporary homelessness, etc.). Southeast CASA (605-760-4825): Supports and promotes court-appointed volunteer advocacy so that every abused or neglected child can be safe, establish permanence and have the opportunity to thrive. 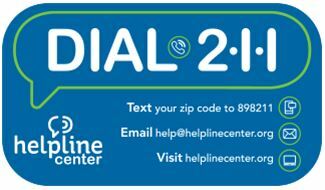 211 / Helpline Center: 24/7/365 referral and resource advice for services in Clay County, assists with emergency management, and provides suicide and mental health crisis counseling. Vermillion Public Transit (605-624-7433): Serves residents from Vermillion and surrounding areas providing local transportation to shopping, jobs, and activities. Also, provides daily transportation to Sioux Falls for medical appointments. Senior Citizens Service / Main Street Center (605-624-8072): Provides Educational, Health and Social events necessary to the senior community of Vermillion and surrounding areas. These include: computer classes, recreational and social activities, and providing information on current event topics relating to the seniors in our community. Dakota Senior Meals / Rural Office of Community Services, Inc. (605-624-7868): Provides meals and assistance to the elderly and disabled, helping them maintain their independence. Weekend Backpack Food Program (605-624-4159): Provides healthy, nutritious meals for students in the Vermillion community. Back to School Backpack Program (605-624-4159): Provides backpacks complete with all of the supplies a student needs to start the school year off on the right foot. Vermillion Food Pantry (605-670-3409): Provides food for Clay County families in need. Habitat for Humanity (605-260-4224): Improves housing options and opportunities for low income families. Lutheran Social Services (605-665-2106): Provides financial education and counseling to support income and personal stability. Boy Scouts of America, Sioux Council (605-361-2697): Guides youth toward making ethical life choices through a positive program based on character, citizenship and physical fitness. Cornerstones Career Learning Center (605-677-6912): Assesses, promotes and provides education and employment training services to area workforce and employers, including ESL and GED preparation. DARE Program (605-677-7100): Gives kids the skills they need to avoid involvement in drugs, gangs, and violence. Girl Scouts, Sioux Trails (712-255-0187): The world’s preeminent organization dedicated solely to girls – ALL GIRLS, where, in accepting and nurturing environment, build character and skills for success in the real world. South Dakota Shakespeare Festival (605-622-0423): Provides education and enrichment opportunities for children around the region. Vermillion Parks and Recreation: Swimming Lessons (605-677-7081): Provides low cost swimming lessons to youth in our community. Vermillion Area Arts Council (605-624-9279): Brings the arts and humanities to the Vermillion area Community and valuable art lessons to community schools. W.H. Over Museum (605-677-5228): Links the areas past to educate and enlighten present and future generations through providing exhibits, events, and speakers.